(1) Apply masking tape on the top center of the steering wheel and steering column upper cover. (2) Drive the vehicle in a straight line for 100 meters at a constant speed of 56 km/h (35 mph), while holding the steering wheel to maintain the course. (3) Draw a line on the masking tape as shown in the illustration. (4) Turn the steering wheel to the center position. 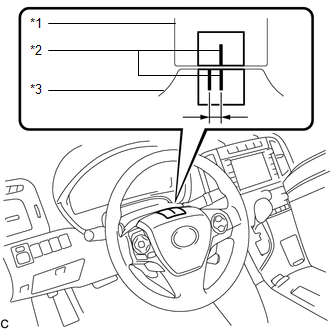 Look at the upper surface of the steering wheel, steering spoke, and SRS airbag line to find the center position. 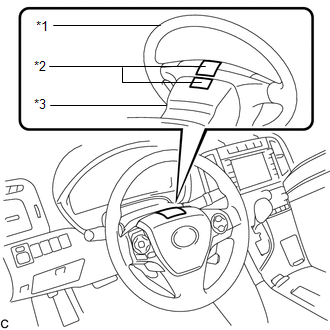 (5) Draw a new line on the masking tape on the steering wheel as shown in the illustration. 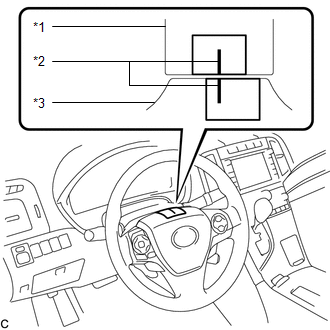 (6) Measure the distance between the 2 lines on the masking tape on the steering wheel. (7) Convert the measured distance to steering angle. Measured distance 1 mm (0.0394 in.) = steering angle of approximately 1 degree. Make a note of the steering angle. (1) Draw a matchmark on the RH and LH tie rod ends and rack ends respectively where it can be easily seen. (2) Using a paper gauge, measure the distance from the RH and LH tie rod ends to the rack end screws. (3) Remove the RH and LH boot clips from the rack boots. (4) Loosen the RH and LH lock nuts. 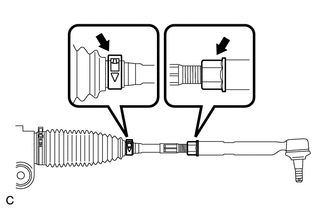 (5) Turn the RH and LH rack ends by the same amount (but in different directions) according to the steering angle. One 360 degree turn of the rack end (1.5 mm (0.0591 in.) horizontal movement) equals to 12 degrees of steering angle. (6) Tighten the RH and LH lock nuts to the specified torque. 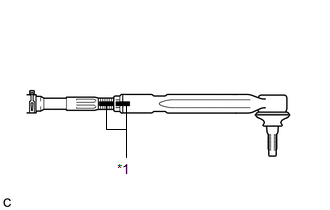 Make sure that the difference in length between the RH and LH tie rod ends and rack end screws is within 1.5 mm (0.0591 in.). (7) Install the RH and LH boot clips.